Who knew I'd be back for more! I hope that I never lose the amazement that I feel every time I set off on a run because it, in itself, is something that is truly humbling and amazing. Don't get me wrong, I love the feeling of my body after a good run: the muscles feeling loose but tired, the sweat dripping all over my body, the breathing bringing refreshment to my beating heart, and the sense of accomplishment for sustaining the movement for the duration of the run. However, I still feel like a kid sometimes when I'm running; doing something forbidden or risky or strange and new. Each time, I feel like a veil has fallen, and I'm a newborn horse moving from its stumbling initial steps into a gallop. Silly, absolutely, but no less true. Maybe this is why running has stuck with me so much because I continued to be awed by something that for decades of my life, I thought was something beyond me. 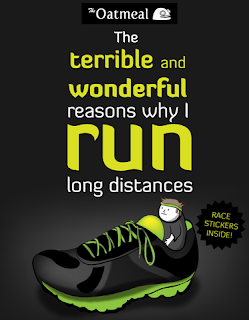 Coupled with the running has been a good amount of writing (just over 60 posts to date) on running; again, another thing I'd never imagine writing so much about (unless it's was like Bart Simpson on the chalkboard, "I hate running" five bajillion times). And from that has been many an email, message, and note from people thanking me for helping them, encouraging them, or giving them food for thought as they begin or continue on their running journey. The Bull and The Cheetah, 10 Ways Running Reminds Me of Learning, The Two Demons I Run With, and "I ran 15 miles, I got assalted, my face hurts, and it's your fault!" are by far my favorite posts that I've written about running as they highlight so much of my inner world while running and thinking about running. As I said, I'm currently recovering from an injury--my IT band has decided it's not happy and so I'm giving it a bit of rest and seeing if that helps before slowly rebuilding myself back up or needing to see any kind of specialist. Thus, it's been weird to hit my 5-years of running mark and not be able to talk much about the runs I've been doing of late. Yet I know that I am not done with running. This past year has shown me that I can take running farther (pun intended) than I have previously. While I have seen myself as a long-distance runner, enjoying half-marathons in particular but also the occasional marathon, I also have begun to make significant progress on speed. 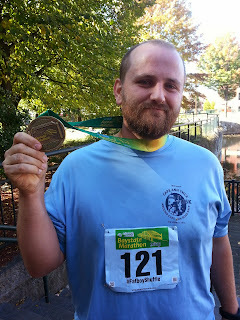 My first half-marathon had me come in at 2:25 and yet, the marathon I ran two months ago, had me at 1:51. Now, that's not necessarily fast for the serious and competitive runners--but for a 36-year-old guy who ranks in the Clydesdale (over 210 weight) and runs in the barefoot shoes, it's pretty damn good. All of this is to say that I 'm finally understanding and learning to improve and maintain a good steady pace throughout the longer races and I believe that I have the chance to continue to do better. 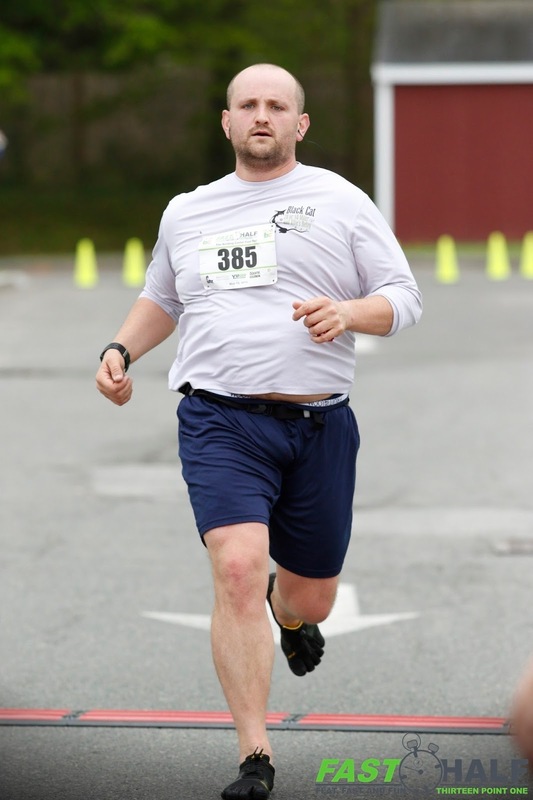 to inspire you to run? It's so hard to explain what changed. 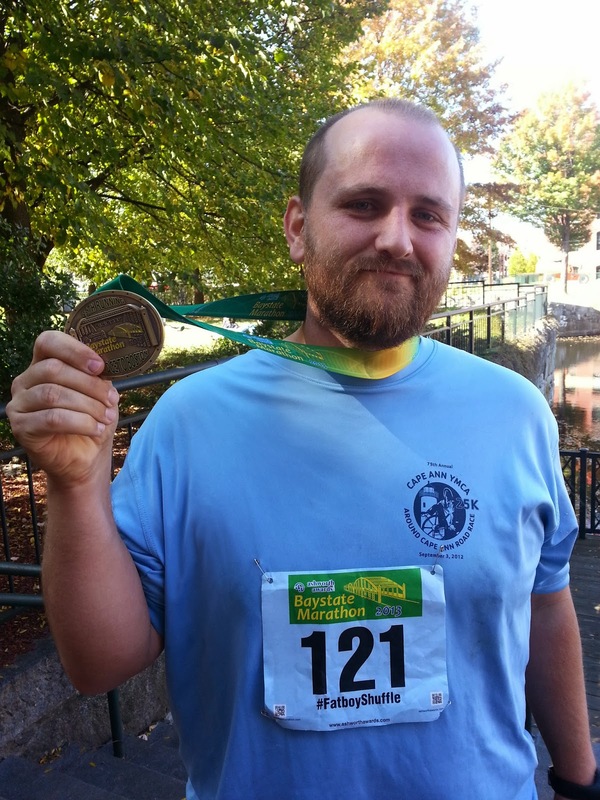 There was a convergence of things that seemed to propel me into running. I've noted that the shoes (Vibrams) played an important role. So did the Fitbit (and Basis) too in terms of helping me monitor progress. I also know that because several people I knew were becoming active runners, that also had a positive impact on me. Especially as I started to run, their support, encouragement, and recognition of my accomplishments (many of them knowing my loathsome view of running previously) gave me little boosts. I know that writing about running and even posting the races that I planned to sign up for aided me, creating some level of public accountability. I also rallied around my accomplishments. Every time, I made a new distance, a new speed, a new challenge, I celebrated--if not publicly, then with a pat on my own back. Basically, I harnessed every piece of positive influence to keep me going and kept myself from discouragement by regularly reminding myself that I was in competition with no one--just on a journey to make me better. Ditch the watch, ditch the distance tracker at the start. Pay no attention to how far or how fast you are going. This is merely noise. Until you feel you are at a point at which you enjoy running, don't bother using a watch. You might want to mark a particular distance that you know is between 3-5 miles (e.g. a bike path, a lake path, etc), but don't track your time until you feel like you can enjoy the running in itself. Make a powerlist of music to keep you going. Early on, keep it limited to your 20 most energizing songs--the kind of songs that you can't help but move every time you hear. Rather than using a clock, you can use songs to measure distance initially. Try to run for at least 3-4 songs and expand from there. Let the music channel through you and get you moving. I can't say this enough. 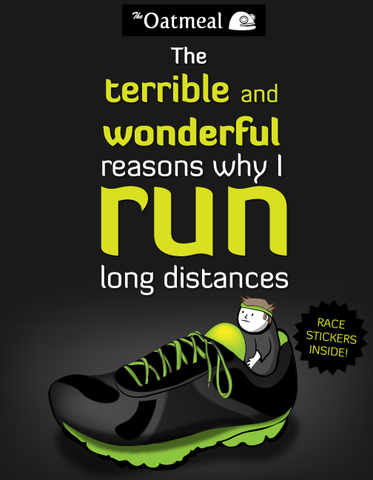 One major reason running never worked for me was because I couldn't figure out my pace. When I got the Vibrams, it meant that I really had to slow down because my feet couldn't take the pain since the soles were so slim. This slowing down was super-helpful because it meant my breathing wasn't being overly stressed. It doesn't matter if you could walk faster, they are different movements. Work on slowing your run and finding your rhythm--once you unlock this harmony, speeding up becomes increasingly easier. This is likely to be the hardest piece of advice here, especially if you are listening to your favorite music as it's likely to push you to go faster, but resist it. Go as slow as you need to until your step, lungs, and heart are aligned. Any time you get out to run, anytime you got a bit further or a bit faster, complete a race, or just struggle and manage to do a run you weren't going to do otherwise--own it and celebrate it. It can be so hard to get up and out the door to run. For some, maybe it is easy, but for others, it can feel like an insurmountable challenge just to get out the door. If you get out the door, celebrate! I would recommend to also join a social-network for health like DailyMile or if you have a device, Garmin Connect (then you can add me and we can encourage and celebrate each other's accomplishments!). No really. Your body affects your mind. If you work to smile while thinking out running, heading out to run, while running, after running, it will affect your overall mood towards running. This will boost your enthusiasm and excitement for running and create a fantastic feedback loop. So that's all I have for now! It's been a great five years running and I am so grateful for each and everyone one of you who have directly and indirectly cheered me on.